Geoffrey Pagen approaches clay with passion and a deep respect for the challenges inherent in this ancient medium. His love of nature is reflected in work that retains the primal power of the California coasts and mountains among which Pagen grew up and where he often finds his inspiration. 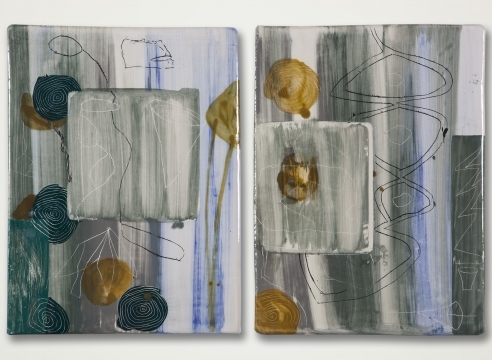 Pagen’s vast experience experimenting with glazing and raku allows him to deftly choreograph the chaos of his medium. His active process combines cuneiforms, drawing, and geometric and organic forms with translucent, opaque, and iridescent glazing. The clay slabs develop into provocative single steles or modular elements of continuing and interlocking design. Much of his work is meant to hang on the wall, although he also explores shaping clay into vessel-like forms using a potter’s wheel. Pagen’s aesthetics and skill create modern interpretations of a primeval material in work that strikingly evokes the natural world that inspired it.